Some concerns about the rushing data analysis. It may be distorted by late fourth quarter plays. For example, the team with the lead may have taken a knee the last three plays, thereby reducing their rushing efficiency. On defense, the team with the lead may have dropped back 8 players, happy to give up 6-8 yards per rushing attempt because they wanted the c;lock to keep running. Ken, thanks. Kneel downs should be eliminated from the rushing data. However, I don’t think it will change the conclusions. As for dropping 8 players, I think that’s a key point. Some defense will do that, and it doesn’t seem to matter in the big picture. Belichick did it this season against Denver when they didn’t have a lead. I think we’ll see it again in the AFC Championship game. You completely misunderstood why that strategy worked. It didn’t work because it was better, the strategy worked because it was different and the Bills hadn’t seen it. Had the Bills been told “Guess what, the Giants are going to play 5 in the box!” they would’ve scripted every possible double team, kick out, power run and gashed them for 8 yards a play. They were caught completely off guard and still almost won. 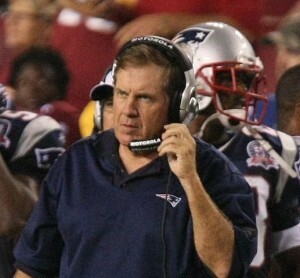 Just like Bill’s patriots gave up 5 TD’s on 6 plays to the wildcat. As the league gets to know a strategy there is diminishing results. The 2-3-6 is nowhere to be found. In a regular season or postseason game the team who rushes for the most yards has a better than 60% chance of winning. Team that passes for the most in a game wins less than 50%. Running efficiency is not real. Every down you can run the ball for positive yardage is a help, unless you are down by 7+. Commitment to the run makes the passing game much easier. As a former D-linemen I can tell you I lived for 3rd and long. I also teach d-linemen the difference between run stopping and pass rushing. Rushing the passer is much easier. Thanks for the comment. My thinking about run/pass balance is evolving. I do think teams need to run to set up the pass, they just don’t need to be that good at it. Check out item #3 in this resource guide. I’m confused as to whether or not you even read the article. You say that if the Bills knew they were going to run dime every play they would have gotten 8 yards per play running… he explicitly says they got 9 yards per rush with their main running back and still lost, so what’s your point. One of my readers, Jason, pointed out that the 2006 Colts had a much better rush defense in the playoffs than the regular season. The Colts allowed an NFL worst 5.33 yards per carry during the regular season. However, they improved to 4.13 yards per carry in 4 playoff games. While better, that’s still about the NFL average over the last 10 years. It would be interesting to see the net rush and pass efficiency numbers of playoff qualifiers over this period when they are in stall situations (as determined by some function of time and score). In these situations we might expect them to run more often and with less success (in terms of yards per rush), while their opponent might run less often and with more success. And they might pass less often and with more success while their opponent passes more often and with less success. Playoff qualifiers should be in stall situations much more frequently than non-qualifiers, so if any of this is going on it would explain some of the difference in the relationships of rush and pass efficiencies to winning. Great point. I plan to look at how efficiency changes as a team’s situation changes in the game. But don’t assume that pass efficiency goes down just because a team passes more (or vice versa). In fact, history suggests the opposite. Check out the charts in this post from Brian Burke at Advanced NFL Stats. 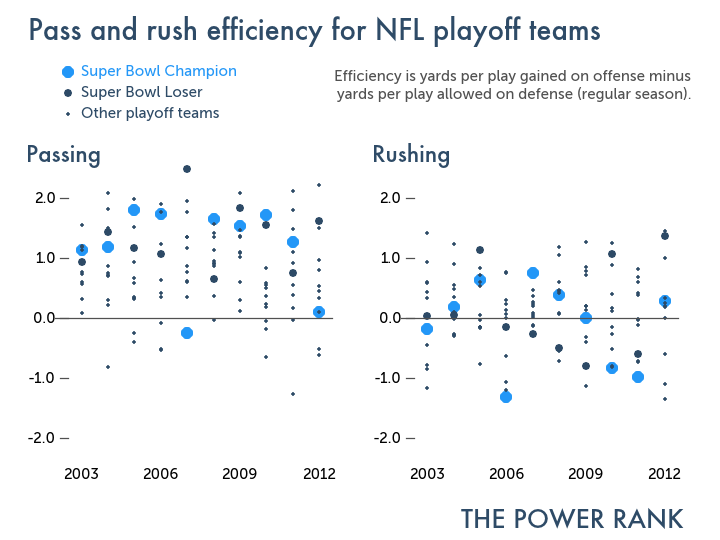 Teams ran less as a fraction of plays in the 80’s, but rush efficiency didn’t budge. The percentage of pass plays has been the same the past decade but pass efficiency has gotten better. An even better way to examine this is % differential. You can get the YPA (Yards per pass) % differential. This shows how team A has performed against its opponents in a stat vs how all other teams have performed against team A’s opponents. This would take strength of schedule into account and normalize things. If not, you are using flat stats and teams have different strength of schedules so not always true enough. Also, with YPA , you can take it further and use Net adjusted passing yards per attempt and then add in a Home bonus or night bonus for the home team. The net YPA removes sack yds lost and the Net adjusted YPA penalizes INTs a certain amount that you apply. I think Net adjusted YPA is pretty good predictor, but in H2H it is only one piece of the puzzle. Home vs Away , Conference, Night vs Day, % differences, elite qb or not,etc. are all important as well. Recent performance is also meaningful along with injuries,etc. ,but yes, Net adjusted YPA is prob one of the best indicators of winning. I like to use that and add in some other important tweaks. Of course rushing is not as important because the yards rushing is much lower than yards passing, but a good run game is nice to have though to compliment the passing game. Also, an even better predictor of winning is points and I would use % difference point differential. I also look at % T/O differential. It never ends. 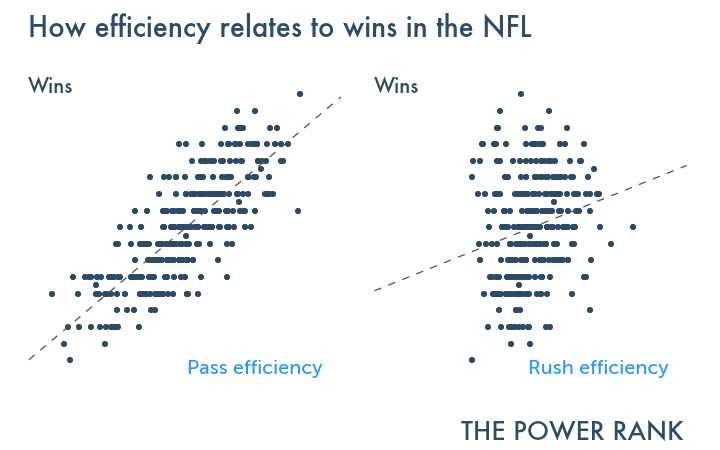 Your whole post seems to be based on the idea that while winning causes more rushing attempts winning does not cause rushing efficiency to change at all. I don’t believe this is the case at all and I think it is significantly affecting your results. For the same reason that teams rush more when they have a lead they also rush less efficiently. The defense knows they’re going to run the ball and they play accordingly. The same thing happens with losing teams and passing the ball. The first is every rushing attempt in 2013 in the 4th quarter while leading by a TD or more. The second is the same but trailing by a TD or more. The Y/A while leading is 3.12 and the Y/A while losing is 5.04. That is a huge and significant difference. Thanks for the awesome comment. Yes, I should really dig deeper into the data. I will when I start looking at this again, hopefully this summer. The 4th quarter data points out the importance of deception in football. Teams in the lead are expected to rush, hence the low ypc. Teams behind on the scoreboard are expected to throw, hence the large ypc. However, I don’t think this will affect the primary result that passing is MUCH more important than rushing in the NFL. We could look at 1st half yards per carry and still see little correlation with winning. What do you make of the fact that Ottis Anderson ran for 102 yards for the Giants and won the Super Bowl MVP in this game? The Bellichek quote is interesting, but there are far many more coaches who pride themselves defensively in making a team one-dimensional and aim first and foremost to stop the run. Another famous coach (Woody Hayes?) once said something to the effect that when the ball is thrown only three things will happen – and two of those things are bad for the offense. We’ve bent the rules in an attempt to highlight the QB and make it “a QB’s league”, but for all of the hype, teams with mega passers are often only able to cite stats and not rings at season’s end. Meanwhile, teams with a more balanced attack, effective special teams and solid defense tend to do well. This is the reason they don’t hire statisticians and actuaries to coach NFL teams. Although stats certainly have their place in the scheme of things, NFL and college football is mostly about television drama. I am sorry, but passing yards do not win football games. The reason this statistic appears to be exclusive to the NFL is because the NFL pushes the passing game for its dramatic entertainment value. Reliance on passing is simply more prevalent in the NFL than in college. If passing were as important to winning as these stats presume, one would expect the leading passing team in the league each year to win most Super Bowls, or at least a respectable number of them. Let’s put the theory to the test. The truth is that only five times has the top passing team in the league even made it to the Super Bowl. They are 0-5, losing by an average score of 33-15. The losers? Dan Marino, Kurt Warner, Rich Gannon, Tom Brady, and most recently, Peyton Manning, in that order. No team has ever led the league in passing and won a Super Bowl in the same season. Don’t place all you bets on passing teams and discount the run just yet. Passing games result in more turnovers per yard gained than the running game, so in that respect the passing game benefits your opponent. It is also more vulnerable to a “prevent” defense. Winning depends upon scoring, not passing yards. Kickers, not receivers or running backs, are usually the leading scorers on most NFL teams and are virtually automatic every time. If a team scores 13 points, 7 of those points are usually made by the kicker. The main flaw here is rationalizing that yards gained is the most important factor in winning a football game, when in reality, it is yards gained per point scored. From my standpoint, it takes fewer rushing yards to score a point in the NFL than passing yards. Football is more complex than chess. Yards per point scored automatically blend in stats for defensive efficiency, special teams effectiveness, field possession, turnovers, scoring by the defense and special teams, and many other aspects of the game. I think if you looked at the stats from this perspective, you would discover that gaining offensive yards does not, by itself, win football games. There is a diminishing rate of return in passing yards per point scored that should be considered. This season alone, teams with a huge advantage in offensive passing yards often lost to teams who ran the ball for fewer yards, but scored more points. Yes, rushing games do take up more time, but “running out the clock” is not the main reason these yards are important. It is because rushing games weaken the defense of the opponent and rests your own defense, both of which pay dividends as the game progresses. The opponent has fewer opportunities to score points and when they do have the opportunity, find it more difficult against a fresh defense, presuming it is a good defense. On the other hand, your offense scores more easily as the opponent’s defense wears down. Offenses can substitute more freely than defenses, so they are able to remain fresh against a tiring defense. Relatively balanced offenses that are more run-oriented are more effective at winning games, especially against strong defenses. Rework your stats using yards per point scored and look at the regression as a curve (maybe using a fifth or sixth degree polynomial) rather than linear, and you’ll see that the win – loss ratio isn’t just about offense and isn’t just about passing yards. I’m not sure I trust the linear regression results as having quite the predictive capability you suggest. What I see is a lot more uniformity with regard to passing than running in the league, that’s all. Give me a team with a great defense, great Special Teams, and a great running game any day over a team whose only goals seems to be to pad the QB’s passing stats. Look how many NFL teams have started using that formula since the Seahawks found success with it, and how difficult it has been to predict game outcomes this year. Complete teams have a better chance of winning than a one dimensional team who puts up a ton of passing yards. The ideal algorithm will never exist, and even looking at yards per point scored won’t produce results that are that much different from your stats. It will account for some predictions that turn out better, while others turn out to be less accurate, because some things simply cannot be foreseen or factored into the equation, and that creates the drama and excitement we all love. Maybe you missed the part where he said that being excellent at passing is no guarantee to win the Super Bowl. Ironic that a reader on this site doesn’t understand the effects of randomness and thinks that for a stat to be most important it needs to be 100% correlated with winning the SB. I agree passing yards have no correlation with winning any individual game. Indeed, the two conditions that connect, in any individual game, to a win or loss are a) running yards (whether cause or effect) and b) INTs. Overcoming both of these, in any individual contest (whether cause or effect) is unlikely, my guess is in the 5% range (assuming a team “loses” in both comparisons). But the interesting thing is that you can sort team quality, year after year, by net YPPA, that is, looking to the team’s offensive YPPA and defensive YPPA and ordering the deltas. I think Pete Palmer stumbled onto this first (as a footnote re: YPPA) and Paul Zimmerman noted the INT (correlates with wins)/Fumbles lost (not much, if any, correlation with wins)—-but Bud Goode studied it for a number of years before his demise. In the NFL over the past few decades, the quality of the quarterback has determined a team’s ability to win more than any other factor. The influence of the QB had become overwhelming. Then we had last season, when the QB matchup was practically irrelevant to the Super Bowl outcome. Pro football works that way. Popular trends (mobile QB, West Coast, possession pass, whatever) become widely adopted over many seasons, then somebody exploits the league-wide bias with a starkly different strategy. Last season’s SB teams (Denver, Carolina) overinvested in defense – from a personnel mgmt perspective – while most of the league was obsessed with the quest for the franchise QB/WR tandem. That is the thing that sticks out to me most. Many NFL teams would rather overinvest in a questionable QB than optimize ROI and build a strength. The popular view was that winning without a franchise QB was impossible. That apparently justified the approach of playing QB roulette until the longshot hits. It’s as though NFL teams are run by PR firms. GMs don’t want to face marketing the team without having a “name” at QB, even that name is a rookie who never even won a major bowl game in college. Sometimes, good rushing teams in the NFL get there by philosophy. Sometimes, they get there because the QB situation is poor, while good runners are plentiful. Rushing stats also can pile up if a team starts a lot of possessions on the 25 rather than in good field position. High-possession games, long field, a lot of rushing yards. Yards per carry = a stat influenced heavily by two factors. One is down/distance situation. Teams that get a lot of their rushes in the red zone, or in other short-yardage situations, naturally average fewer yards per rush. I like to look at yards gained as a % of yards to first down or TD. Does not strip out all the difficulty factor of running into a prepared defense vs. rushing primarily as a changeup, but it helps. The other factor is offensive design. An offense that uses the rush to keep the defense honest naturally averages higher yards per carry. Fewer running attempts, defense spread out not stacked up, and the rusher is going to be quick/fast, plays designed to enable the back to beat a couple of defenders instead of trying to find a seam in a pile. One thing you’ll probably find is that overinvestment in a talent-rich position (RB for example) is likely to have a poor ROI. How often does it pay to draft RBs in the first round? Does it make sense to carry the salary of a superstar rusher? This factor might help to explain why the team with the greatest RB never wins it all anymore (if ever). Paying too much to one player shrinks the blanket that’s supposed to cover the rest of the bed. Is it possible to write algorithms that capture all the important differences between NFL teams? It’s not possible to capture everything about NFL teams quantitatively. That’s what makes football great!